This year Kia cars for SEMA were a bit different than usual. they all were sport themed models designed for no other reason than being a canvas on wheels! Check out this Soul for example. Built by West Coast Customs, the golf-themed “Hole in One” Soul was inspired by Michelle Wie, Kia’s official golf ambassador and one of the most recognisable young athletes around the world. Features? 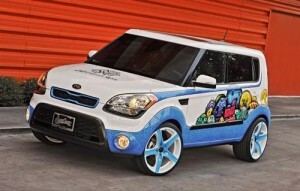 Well, it gets “So Blue” exterior paint scheme and five-spoke 20-inch wheels incorporate her original artwork. Wie’s artwork and personal logo also are integrated into the Soul’s “Snow White” leather headrests, while a baby blue painted dash and pink headliner and seating accents complete the whimsical interior look. Driver and passengers will be instantly transported to the golf course by the artificial grass flooring throughout the Soul, and opening the rear hatch reveals a virtual driving range with a 26-inch LED TV monitor mounted into the rear hatch and a Microsoft X-Box 360 video game console and Microsoft Kinect system to play golf out of the back of the vehicle. Two of Wie’s tournament-used golf bags are mounted behind the TV and conceal eight-inch speakers and a subwoofer.